[ANN][Main] Bitcore- BTX - Partnership with JAXX and ZelCore! Bitcoin Forum > Alternate cryptocurrencies > Announcements (Altcoins) (Moderators: mprep, Welsh) > [ANN][Main] Bitcore- BTX - Partnership with JAXX and ZelCore! hi guys ! my BTX wallet isn't sync. week ago it was totally fine. More than 1 hour I waiting and got 0 connections. What is the problem ? How would I find out if my signing up worked or not? I got confirmation that all was done on the webpage when signing up, but others have been receiving 6% and mine hasn't come through yet. Am I just being impatient or is there a way of checking I'm properly registered? I will add I've got active connections. I just need confirmation that this will resolve the issue. If not, can someone please advise. Thanks. Airdrop is over when main airdrop wallet is empty. 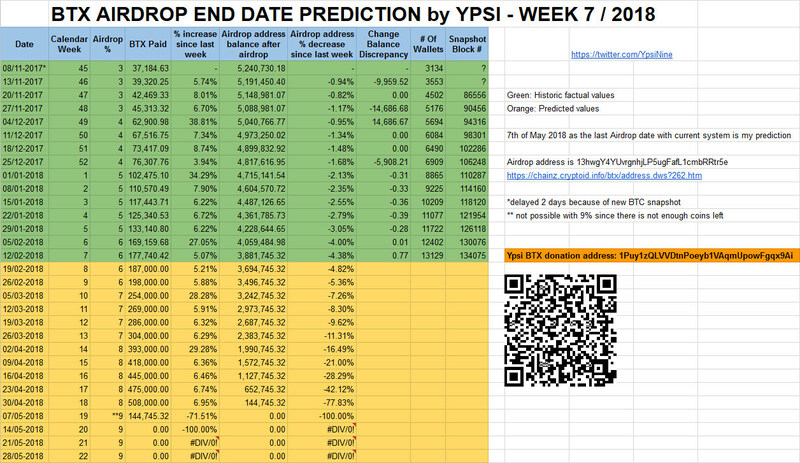 New week and a new updated airdrop end date prediction calculation from me. So for this week I predicted 180 000 coins to be dropped, while the actual number was 177 740. So pretty close! This slightly-lower-than-predicted number makes the end date move from April 30th to May 7th as it seems we are in a new trend where the weekly percentages are increasing slightly slower overall than in the beginning of this airdrop journey. Next week I've predicted 187 000 coins to be dropped. You can see how that prediction holds up next Monday when I'll be back yet again with a new update. Thanks again for doing this ypsi. That is good news for holders then, might be able to get an extra drop or two if it continues this way. I did not really expect that. I thought the end date of the airdrop would decrease and not increase. It's great to be wrong and still be happy about it! Thank you for your predictions ypsi! If you did registate for airdrop with Coinomi adress then do no "send" transaction after. If you do your funds will be split to a new adress on the blockchain and your original adress will have a balance of ZERO. @ypsi you are an awesome cat for making that table for us. Thanks for the drop dev, and I don't get it why are people against the pink? I haven't put it in yet but am excited to install the new wallet myself ! If you register for airdrop check the following list if you've been added. If so it will be fine. This also happens in the original Bitcore wallet if you do not know how to adjust the wallet for the airdrop. Many times this is already written here and at the Coinomi Telegram group. In the upper right corner, click on three dots and choose 'settings'. In the 'Manual receiving addresses' field where it says 'Do not automatically create a new address for every transaction.' click on the check box. That's it! It is very easy to blame others for their own mistakes, right? Show must go on! Project BTX too! I have a twofold feeling. I am both happy and upset that the airdrop is go on. I'm glad because I'll get more coins. Frustrated by the fact that the listing on major stock exchanges, too, is postponed until the end of the airdrop. Are there any special plans for Valentine's Day for BTX? It's a Pink BTC but better....surely there must be some marketing or something in store? Also, what is this about? BTX devs donated a "February 14 bonus" to chainz 3 days ago ....for what purpose? It's the first time the BTX team ever gave a bonus to the block explorer. Therefore I followed all steps (ie. enabled coin control features and sent BTX from a registered address) and today I sadly realised that missed the airdrop again . How is that possible? Any thoughts? Thx! PS: Where can I find the snapshot time? There is no miracle. If you register your wallet and find it on the list you will get AD.